Steve Camden is an exciting new author that I’ve been hearing a lot about. It’s All About Love is Steve’s second young adult novel and it sounds fantastic. Read the blurb below and watch Steve’s video of his poem about It’s About Love. It’s About Love is out now from HarperCollins New Zealand. If you have read Annabel Pitcher’s debut novel My Sister Lives on the Mantelpiece you’ll know what an amazing writer she is. My Sister Lives on the Mantelpiece was one of my favourite books of 2011 and I’ve been dying to read Ketchup Clouds ever since Annabel first started talking about it. Ketchup Clouds, is every bit as extraordinary as her first book and it will stay with you long after you reach the end. Fifteen-year-old Zoe has a secret – a dark and terrible secret that she can’t confess to anyone she knows. But then one day she hears of a criminal, Stuart Harris, locked up on death row in Texas. Like Zoe, Stuart is no stranger to secrets. Or lies. Or murder. Full of heartache yet humour, Zoe tells her story in the only way she can – in letters to the man in prison in America. Armed with a pen, Zoe takes a deep breath, eats a jam sandwich and begins her tale of love and betrayal. Ketchup Clouds is an utterly beautiful, heart-breaking story, told in an original and very clever way. The whole book is a confession of what Zoe has done, to someone who she knows will understand, but won’t be able to do anything. I don’t want to say too much about the story for fear that I’ll let some important detail slip. Annabel gives you enough detail that you know vaguely what has happened, but you just have to keep reading to find out exactly what happened and to who. She leaves you hanging on every word and dreading what is inevitably going to happen. There are several things that I really like about Annabel’s writing. I really like the way that she ties up the story at the end, bringing everything together and showing you how the characters have turned out. Like her first book, My Sister Lives on the Mantelpiece, you feel completely satisfied at the end and you’re left amazed at how her characters have developed over the course of the story. I also like the way that Annabel portrays the parents in the story. The parents have their own problems that they are dealing with in their own way, and they’re not always the best parents, but deep down they love and care for their children. They are important parts of the story and Annabel portrays them as real people, not just characters in a book. The main reason I loved Ketchup Clouds was the relationships between the characters. The relationship between Zoe and Stuart was really interesting, because even though we never hear from Stuart, Zoe’s tone changes the more she writes to him. At the beginning she calls him Mr Harris, and by the end she’s calling him Stu. She seems to get more comfortable with Stuart as time goes by and becomes less formal with him. Zoe and her sister Sophie have quite a close relationship and they talk quite openly with each other, especially when it comes to talking about their parents. Zoe’s relationships with Max and Aaron are quite different and Annabel does an excellent job of portraying Zoe’s conflicting emotions and the tough decisions she has to make in their relationships. Annabel Pitcher is one of those authors whose books I’ll read no matter what they’re about, and I certainly can’t wait to see what she will write next! I’m sure I’m not the only person who wonders if we’ll ever get to read Bizzle the Bazzlebog. Grab a copy of Ketchup Clouds from your library or bookshop now. Sometimes you discover a book that you know you are going to love without the book even being published yet. You hear or read about the idea of the story and it sounds so exciting, clever, and original that you want to read it right now. David Levithan’s new book, Every Day, was one of those books for me. It was even more amazing than I had imagined. Every day a different body. Every day a different life.Every day in love with the same girl. Can you love someone who is destined to change each day? Every Day is one of the most extraordinary, thought-provoking, and emotional stories I’ve ever read. Even now, 3 days after reading the final sentence, I’m struggling to put into words how much this book has affected me. It’s completely different from anything I’ve ever read, because usually the narrator stays in one body throughout the story and they interact with the same characters. In Every Day, A is in a different body each day, so it has to get used to being a different person (on the outside) and acting like that person. One of the most interesting things about this book is the way that you look at the character of A. Even though A doesn’t know if it is male or female, I imagined A as a male right from the start. However, I think each reader will picture A differently. Sometimes it can take you a while to put yourself in the main character’s shoes, but I immediately empathized with A and what it was going through. You try to understand what it would be like to wake up each day as a different person, but you can’t really grasp how difficult it would be. A has been this way from birth, so it has never known anything different. I thought it would be incredibly difficult for a child to understand what was happening to them, but for A it was just life. A seems to have figured out what to do each time it wakes up in another body and makes its way through the day. Every time a new day would start, I’d be wondering, like A, who it would be waking up as. Would A be a black girl, a gay guy, have a gorgeous body or be incredibly overweight? Then when A has found out who it is, how will A use that body and what will A do today. I could totally understand why A wanted to spend every day with Rhiannon. I’ve never had a crush on a book character before, but I would certainly want to spend every day with her. The thing I love the most about A is the way that it respects the bodies that it is in. A tries incredibly hard not to interfere with the lives of those people, and tries to fix mistakes that it has made while in those bodies. Ultimately, Every Day is a love story. A and Rhiannon’s romance is doomed to fail, because even though Rhiannon may love A, she’s not always going to love the person he is on the outside. I loved the interactions between A (in its different bodies) and Rhiannon and you are hoping with all your heart that they can be together. David Levithan’s ending to the story is absolutely perfect, and has to be my favourite ever ending of a book. I was sad to finish the book, because I loved David’s beautiful writing and I didn’t want to let A and Rhiannon go. Every Day is one of those books I want to carry around everywhere with me and tell everyone I know to read it. Thank you David Levithan for giving me this story! The best picture books are those where the text and the illustrations are perfectly matched. Even though the author and illustrator may have worked in different parts of the world, the book is so perfect that they could have been working side by side. A Hare, a Hound and Shy Mousey Brown, written by Julia Hubery and illustrated by Jonathan Bentley is one of those rare picture books. ‘There’s a hare in the air, there’s a hound on the ground, and watching them both is shy Mousey Brown.’ On the first page we meet these three very different characters. The hare is bouncing around, full of joy, while Mousey Brown watches on, hoping the hare will notice him. But when the fearless hare dances right up to the hound and tries to wake him, Mousey Brown has to be brave and save the hare from the hound’s jaws. A Hare, a Hound and Shy Mousey Brown is a beautifully illustrated picture book, full of joy, mischief, and three very loveable characters. Julia Hubery’s rhyming text begs to be read aloud and it simply rolls off your tongue. It’s the sort of story that’s perfect to act out because of the three different characters and their very different personalities. The hare has lots of energy and is always bouncing around, the dog is pretending to sleep, and Mousey Brown is just watching from afar and trying to warn the hare. Jonathan Bentley’s illustrations are absolutely gorgeous and he’s perfectly captured the personalities of the three different characters. The illustrations are cute but full of character. I love the way that Jonathan has captured the complete joy and carefree nature of the hare, the irritation of the hound, and the admiration and worry of Mousey Brown. Even before I opened the book and read the wonderful story inside, Jonathan’s front cover grabbed me and I knew it was going to be special. Like Mousey Brown, my heart goes pitter-pat-pounding with love for Julia and Jonathan’s book. I hope that we see more picture books by this amazing duo. One of the things that excites me the most as a reader is finding new authors, especially ones that blow you away with their originality. Cat Patrick is an exciting new author I discovered last year when I read her debut YA book, Forgotten (read my review here). Forgotten is one of those books that sticks in your mind long after you’ve read it because it’s totally original and stands out. Cat’s latest book, Revived, is just as amazing as Forgotten and hooked me in from the blurb. She’s a test subject for a government super-drug called Revive, which brings people back from the dead. Each time she is revived, Daisy has to move cities and change her identity to avoid suspicion. Daisy has always got a thrill out of cheating death, but her latest move has come with unexpected complications: a new best friend, and a very cute crush. As Daisy’s attachment to her new home grows, she discovers secrets that could tear her world apart. And the more she learns, the more she feels like a pawn in a sinister game. When the stakes are life and death, someone’s going to get hurt. I had high hopes for Revived after loving Forgotten and it totally lived up to them, and more. It’s difficult to try and put Cat’s books into a category or genre because they’re mostly a real-life story, but with a touch of science fiction thrown in. Daisy first died in a bus crash when she was four, after which she got taken into the Revived program and now lives with two agents who pretend to be her parents. Her and the other ‘bus kids’ have to undergo regular testing to make sure they are healthy and to ensure the drug is doing its job. I thought that the background and structure of the organisation behind Revive that Cat created was really clever. At the top there’s God who makes all the decisions and is in charge, then there are the agents who work for God called Disciples, and at the bottom are the Converts, those ‘bus kids’ who are part of the program and are given Revive to bring them back to life. God thinks that he can do whatever he want and that nobody will stop him, which raises some interesting ethical questions in the story. Another thing that I really liked in Revived, and also in Forgotten, is that Cat creates relatable male characters that aren’t douche-bags. You won’t find any love triangles with moody, mysterious guys in Cat’s books. The love interest in Revived is Matt, a normal, average guy who is friendly and loyal. The relationship between Daisy and Matt progresses naturally throughout the story and they have their share of ups and downs. There isn’t smoldering passion because there isn’t the need for it in the story and it would seem wrong between Cat’s characters. Any teenagers who want to know what love feels like should read Cat’s books. There’s something in Revived for everyone – mystery, suspense, romance and a touch of science fiction. 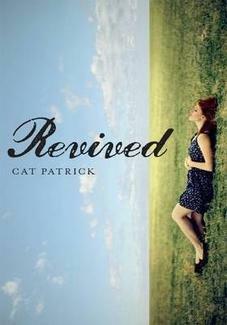 Get your hands on Revived and discover the amazing writing of Cat Patrick. Paranormal romance is one of my least favourite genres, because often the romance totally overwhelms the story. Some of my favourite YA books from the past few years have centered around teenage relationships, whether it’s a girl who has to remind herself every morning about the guy she loves, a red notebook that bring a guy and a girl closer together, or a terminal illness that gives two teens a shared experience. I’ve listed my favourite YA love stories below (with links to my reviews). The characters in these books feel like real people, with real problems, who have realistic relationships. What are your favourite YA love stories? There are alot of picture books around that are about love. Usually they feature rabbits, bears, or even kangaroos, but until now there hasn’t been one featuring a monster. Love Monster by Rachel Bright is the perfect picture book to give to your valentine this Vanlentine’s Day. Love Monster is about a little red, furry monster who is ‘a bit funny looking to say the least.’ He lives in a place called Cutesville, filled with all the cute, fluffy things you could imagine, like puppies, kittens and bunnies. Nobody loves him so he sets out to find someone that will. He looks high and low, inside and out, but he search proves fruitless. Just when he gives up and starts to go home, love finds him. Rachel Bright’s story about finding love in the most unexpected place is cute, funny and smart in just the right doses. It’s not sickly sweet like some books about love. The monster in this book isn’t scary, but one of those ones you want to pick up and cuddle (kind of like Mike Wazowski in Monsters Inc.). Rachel’s illustrations are big, bright and bold and remind me of those pictures I used to do when I was at primary school where you use crayon and ink. The picture of the monster holding his teddy with his sad face on the front cover will definitely stand out on the shelf. You’ll want to share Love Monster with the slightly hairy monster in your life, as well as the not-so-hairy ones that would love to live in Cutesville. My first book of 2012 is one that’s been calling me from my ‘to-be-read’ pile since it was published in September last year. 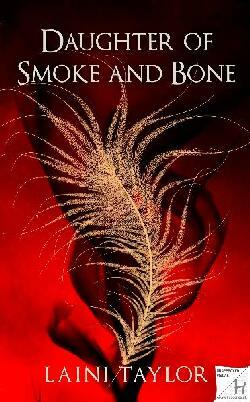 Laini Taylor’s Daughter of Smoke and Bone is of those books where, as soon as I saw the front cover, I knew it was going to be good. After finishing it today I wonder why it took me so long to get around to reading this beautiful story. Karou is a seventeen-year-old at student living in Prague. With her attitude, blue hair and tattoos, she stands out from the crowd. Her sketches of mysterious and beautiful creatures are the envy of her fellow students, including her best friend Zuzana. No one knows about her other life, as the errand-girl to a monstrous creature who is the closest thing she has to a family. Karou knows nothing of her real family, only Brimstone and the other chimaera who have raised her. She has been raised half in our world, half in ‘Elsewhere,’ the dark world which she knows little about. As Brimstone’s errand girl, she travels the world buying teeth from murderers and hunters, trading them for wishes of various denominations. Karou soon finds her world turned upside down when the seraphim destroy the portals back to Elsewhere, trapping her in our world, not knowing whether her family are alive or dead. When one of the seraphim attacks her a train of events is set in motion that will lead her back to Elsewhere and the truth about who she is. From the first chapter, Daughter of Smoke and Bone cast a spell on me and I was totally immersed in the story for days. I felt like I was right there beside Karou and Akiva, from the streets of Prague and Marrakesh, to Brimstone’s shop and the caged city of Loramendi. The sights and smells of these places were so vivid that, even when I wasn’t reading the book I was thinking about them. Laini Taylor’s writing is absolutely beautiful and so full of emotion. I wanted to keep reading particular sentences just to taste them. Karou is a character that I really connected with because you could really get inside her head and know what she was feeling. I felt her heartache, love, longing, loyalty and fear. The thing I loved the most about the story was the creatures and places that Laini created. The chimaera, which are made up of different animals and humans, reminded me of the mysterious creatures from Guillermo del Toro’s films, including Pan’s Labyrinth and Hellboy (especially the scene in Hellboy: The Golden Army at the troll market). Daughter of Smoke and Bone ends on a cliff-hanger, with a heart-wrenching discovery so I will be eagerly awaiting the next book. Until then, I’ll savour this beautiful story.